We meet back up with Nancy as she's about to be discharged from the hospital after having her baby boy. She needs to sign the birth certificate, but after a quick visit from Pilar and Esteban, she's unable to put down him as a father and cribbles something down. She decides to go back to Andy's and finds Andy has taken over her old room and refuses to give it back. He also reveals that the hospital called him... she put him down as the father and he refuses to allow her to. 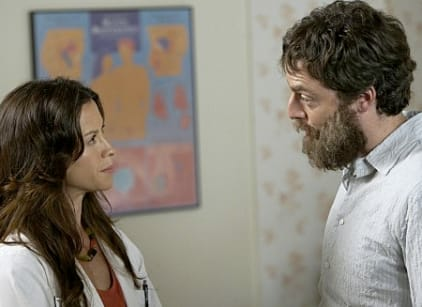 With his newfound confidence, Andy shaves his beard and heads to Dr. Kitson's office and asks her out on a date, to which she accepts. Andy goes on the date with her and she basically rejects him for not doing anything with his life when he's close to 40. A crushed Andy tells Nancy he wants to be significant and wants to be the father, but not just in name. He wants to help raise the baby 50% and he wants the baby to be raised Jewish. They have a bris for the baby and name it Stevie Ray Botwin. An angry Esteban shows up and demands that his baby be baptized and not raised by Andy, but Nancy finally stands up to him and kicks him out. The doctor also shows up and even shows a little interest in Andy, though she claims she's just there for the baby daddy drama. Doug and Silas go to Dean for help in getting their dispensary running again. He manages to get it back for them. Meanwhile, poor Celia is stuck in a contract, unable to sell any makeup, and also goes to Dean for help. While there she sees the boys weed all around the office and has an idea to sell weed with her makeup. She beats up Dean and makes him let her steal it from the boys. The title refers to how Andy told Dr. Kitson she could identify his car.